We must be on the same wave length, I recently was looking all over for pine nuts to make pesto but could not find them. End result was store bought pesto, which I am sure did not taste near as good as yours. Nothing beats fresh ingredients. Hi Tina, I bought my pine nuts at Kroger. What an interesting sory about pesto! This is one of my favorite condiments. I love it in the summer when I can grow the basil myself in the summer and make my own! Your pesto looks delicious. There are so many pesto recipes, and all equally delicious I,m surw. Oooh...I LOVE pesto! Pretty cool that there was at one time a CANNED pesto - but home made is best! Pesto is one of my most favorite sauces. Hi Michelle, pine nuts are very expensive. I normally don't buy pine nuts just because they are so expensive. I went on a hunt with you, here is what I found on Amazon. http://www.amazon.com/Candy-Express-1LB-PINE-NUTS/dp/B0038KDV96, that's a good deal, considering how high they are. Great recipe - especially good for dinner in a flash! Thanks! One of my favorite things in all the world to eat! I love that color! I like very much the addition of walnuts in your pesto. Have a nice day. Great history re: the pesto. Love your edition with the walnuts, as well. When I don't have pine nuts on hand, I just use all walnuts, which works fine. Christine, pesto is my favourite! Yours sounds incredibly good. Thanks so much for sharing. I love pesto, though I have grown a tad nervous about pinenuts ever since I got pine mouth. I miss them : ( It's fun to experiment with different herbs for it like this - arugula is great too. Hi Trix, A small minority of pine nuts cultivated in China can cause taste disturbances, lasting between few days to maximal a week after consumption. A bitter, metallic taste is described. Though unpleasant, there are no lasting effects. This phenomenon was first described in a scientific paper in 2001, Some publications have made reference to this phenomenon as "pine mouth". The Nestle Research Centre has hypothesized that a particular species of Chinese pine nuts, Pinus armandii, is the cause of the problem. The suspect species of pine nuts are smaller, duller, and more rounded than typical pine nuts. This finding has recently been confirmed. In 1998 the FAO published a list of edible tree nuts, containing 29 species of pine nuts that are regularly consumed somewhere in the world and the aforementioned Chinese pine species were not included. Metallic taste disturbance, known as metallogeusia, is typically reported 1–3 days after ingestion, being worse on day 2 and lasting typically up to 2 weeks. Cases are self-limited and resolve without treatment Moller has postulated an hypothesis that could explain why the bitter taste appears several days after ingestion and lasts for as long. A well known physiological process known as enterohepatic recirculation (EHR) could play a key role in the development of PNS. I ussually buy pesto and then leave it in the fridge for 4 monthsa nd it goes bad, haha. But maybe if I made it I'd use it right up? That's my logic. Looks great! Hi Christine, thanks for following! I've been following you from way back and always enjoy reading the history behind your recipes. Pesto is always a summer favorite of mine. Can't wait to make some soon when my basil plants are at their peak. Walnuts are nice alternative to pine nuts especially when their price goes up. But I do love the flavor of pine nuts! I love making pesto too! Love your version of it!! Pesto is SO GOOD! I can't believe it wasn't popular in the USA until the 80's or 90's...and I have never seen it made with parsley OR with walnuts, so I am excited to give this a try. What do you normally use your pesto on? I like it with pasta and on bread, but curious if anyone else has some great ideas. Hi Kelsey, I normally use pesto on, pasta, toast, sandwich, fish. 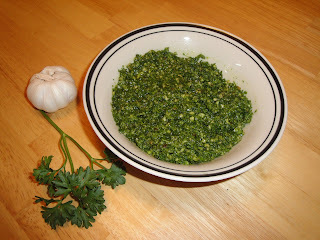 Pesto is one of my favorite sauces...it's so versatile. Love pesto and this is looks so healthy and delicious. I've always used either pine nuts or walnuts in pesto...never together...must try your version!